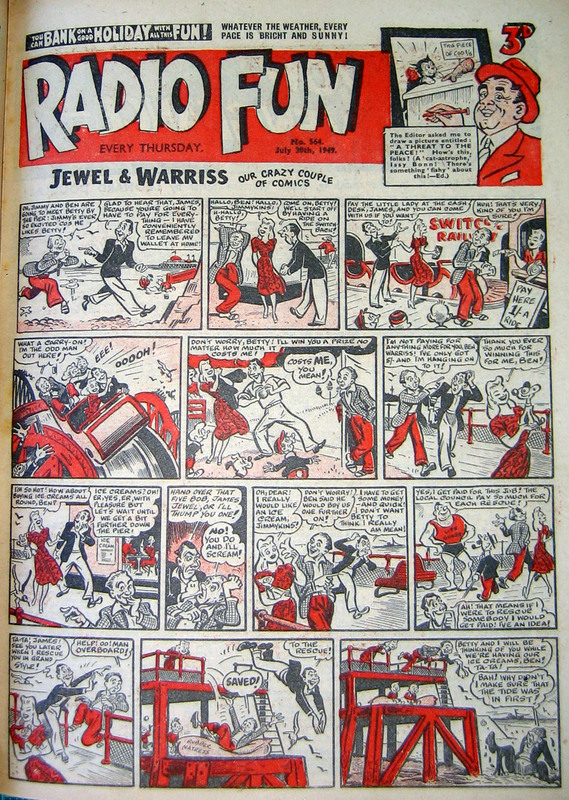 One of these days I'll find time to do a proper blog article on classic comics again but in the meantime here's a look back in time to the cover of Radio Fun No.564, dated July 30th 1949. 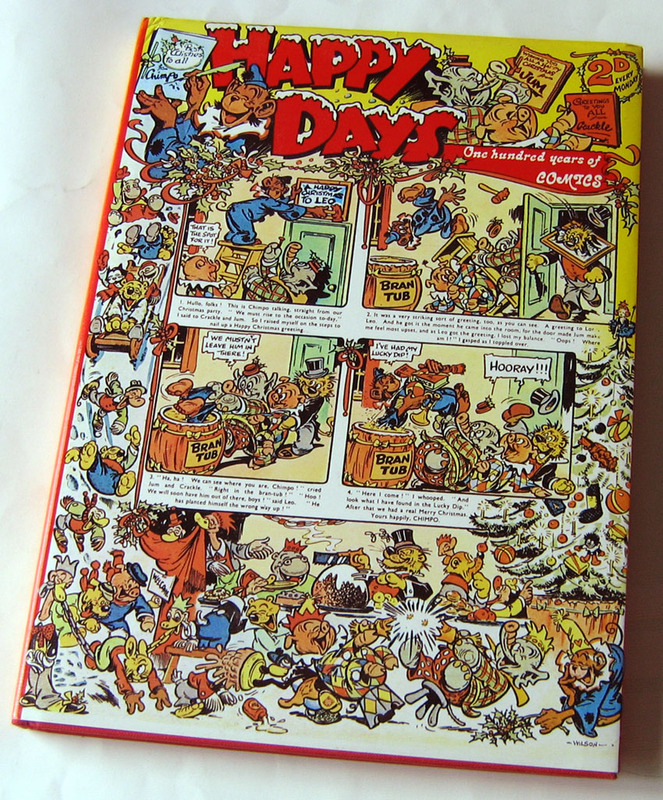 At a time before Summer Specials became the norm, weekly comics celebrated the holiday period with seaside tales of their characters. Here's Jimmy Jewel and Ben Warriss having a day out with five shillings between them. Artwork is, I believe, by Reg Parlett. Alan and Kev will be signing from 2pm to 6pm, but before that, Gary Spencer Millidge will be at the shop for a signing of his new book Alan Moore: Storyteller (an excellent biography of Alan, which I'll be reviewing here as soon as time allows). I was saddened to hear that Martin Skidmore passed away last night after a long fight with cancer. As many of you will know, Martin was the editor of the fanzine Fantasy Advertiser in the latter part of the 1980s and was also an editor at Trident Comics around that time. In more recent times he had revived FA as an online magazine. I hadn't seen Martin for many years but knew him well when he he was a regular attendee of comic marts and conventions in the 1980s. A sociable, intelligent, and affable man, Martin had a great enthusiasm for comics and appreciated it in all its forms from the small press, the independents, and the mainstream. 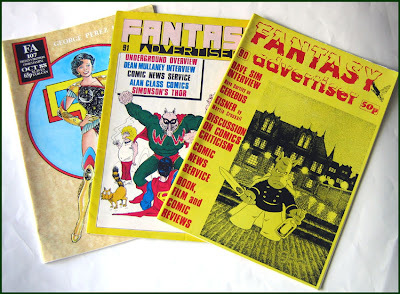 He demonstrated this enthusiasm in the wide-ranging contents of Fantasy Advertiser when he succeeded Martin Lock as editor/publisher with issue 90 in April 1985. As anyone who's tried it knows, editing a fanzine isn't a simple task, but Martin handled it well, overseeing and collating 50 plus pages of news, articles, and interviews every two months. 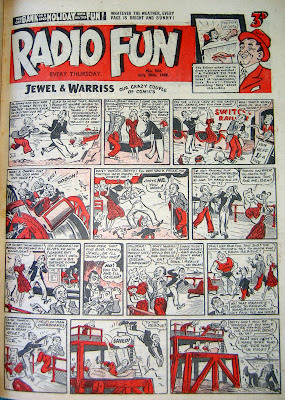 Martin was active in the industry at an important time for comics. The medium was growing up, becoming more experimental, and Martin was involved in all of that, either by reporting on it, interviewing the people involved, or contributing to it himself. And he was right in the heart of it too, attending the Westminster Comic Marts at Central Hall in the 1980s and the lunchtime drinks in the nearby Westminster Arms with Alan Moore, Dave Gibbons, Kevin O'Neill, Eddie Campbell, Mick McMahon, Brian Bolland and many more. Good times, and I think Martin would have been very proud and pleased to have lived through those years. 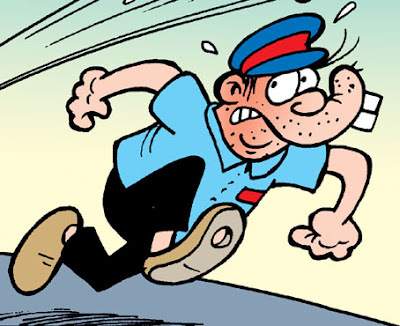 Yes, Postman Prat returns to The Dandy this week for a second series! His misadventures begin in the issue out tomorrow (Wednesday 27th July) which is also a 44 page bumper edition with a cover-mounted gift. 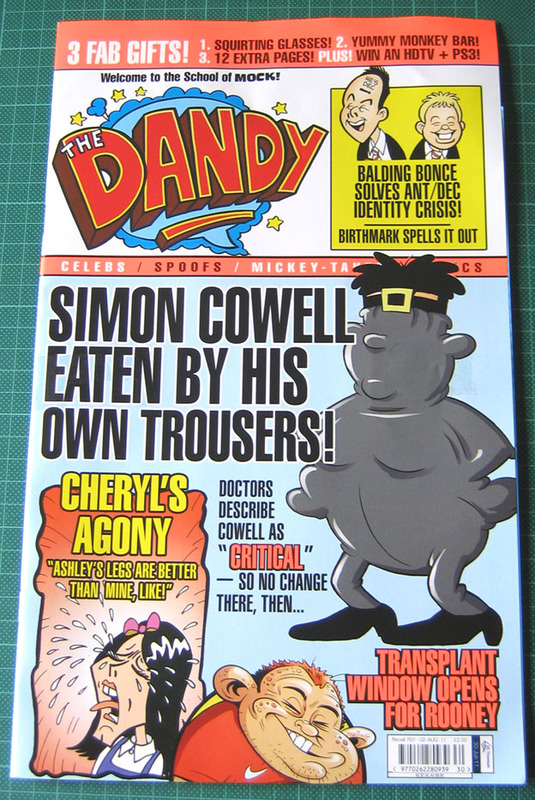 This special big issue of The Dandy will be £2.50. Remember, - it's 100% funny! As you can see, I've tweaked the blog's logo again and Blimey! now has a brand new look. (The previous change was in January.) You'll notice that the sub-title "It's another blog about COMICS!" has been dropped. 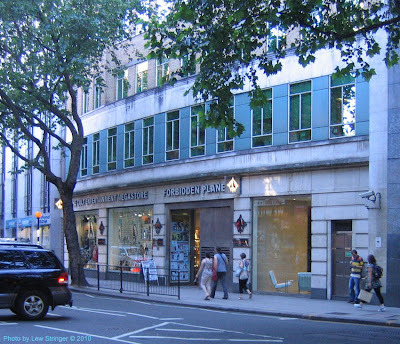 It had been in use since the blog's debut in December 2006 but as a few other blogs had imitated it in some way or other I thought it had diluted it a bit so I decided to ditch it. The font I've chosen for the new logo is called DangerGirl, based on the lettering of J. Scott Campbell for his Danger Girl comic book. I thought it had a nice classic British comic logo feel about it, which was my intention for the new blog header. The other thing is, I'm not looking for writers. 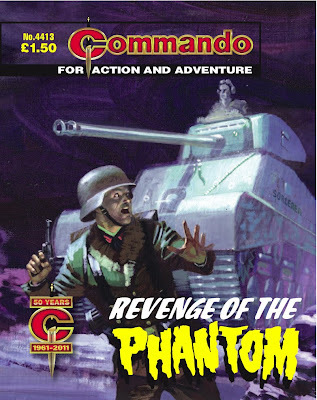 Thanks for the offers but I just use this blog as a place to cover classic comics when I get the time, and to promote one or two current comics if I can. Hope you continue to enjoy it. 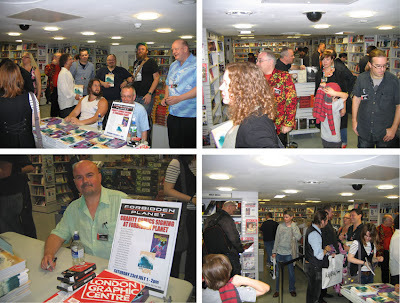 The official book launch for Spirit of Hope took place on Saturday 23rd July, with around twenty of the contributors present at London's Forbidden Planet Megastore. As most of you must be aware by now, Spirit of Hope is a charity book produced in aid of the victims of the New Zealand and Japan earthquakes and tsunami. 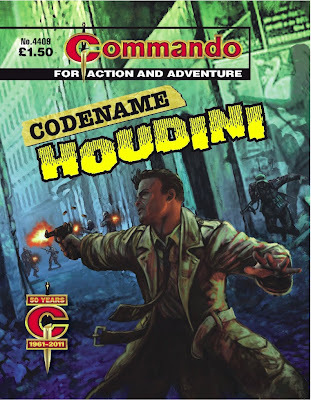 Many comics people rallied to the call and the 116 page book is an achievement that all of us involved are proud of. Saturday was the first time I'd seen the finished book and I was amazed at the sheer variety of styles within its pages. As one reader noted, it really does show the huge versatility of comics. Contributors include long established professionals to relative newcomers and small press creators, proving the equality that exists within the comics community. 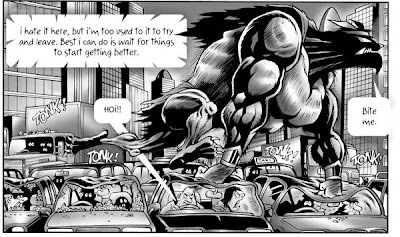 With an anthology book like this there is always a risk that some pages will be weaker than others but there really isn't a duff note in the entire book. Every page is clearly from the heart, and the passion and, well, spirit of hope, that each contributor felt carries over to the reader. 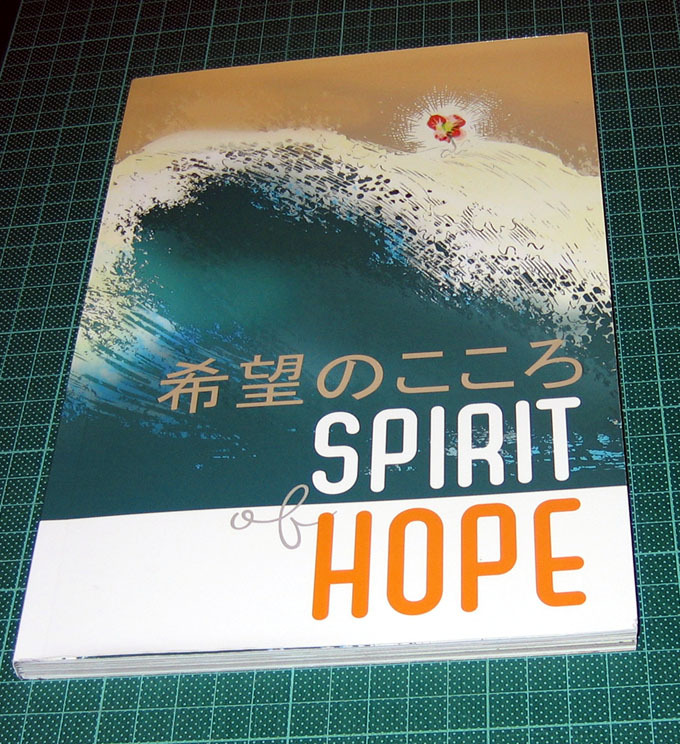 It's a very moving book, and a very uplifting one. There's some really powerful and emotional stuff here. One that got to me was Courage by Leonie O'Moore; about the two dogs that were rescued, one standing guard over his injured friend. Other stories are equally as emotional and, such as The Ship by Richard Clements and Inko, heartbreaking. 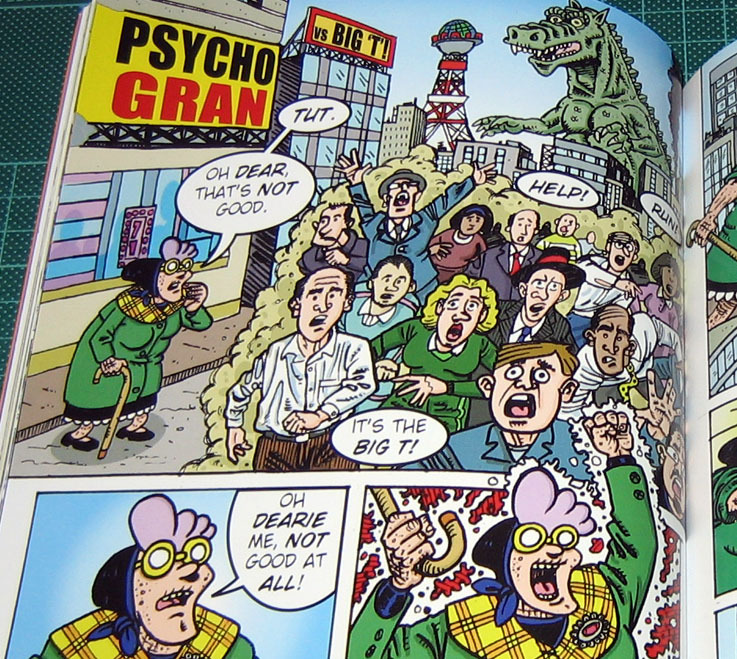 About halfway through the book there's a bit of light relief with David Leach's Psycho Gran making a welcome return. 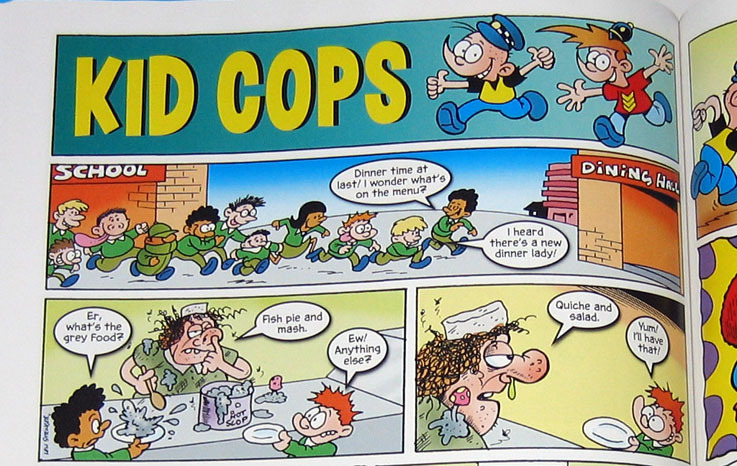 A comedy strip but not disrespectful to the theme. The editor faced with the enormous task of making this book work was Alan Cowsill, and what a fantastic job he did. Alan has paginated the book well, so strips don't clash in style and the book is nicely paced. 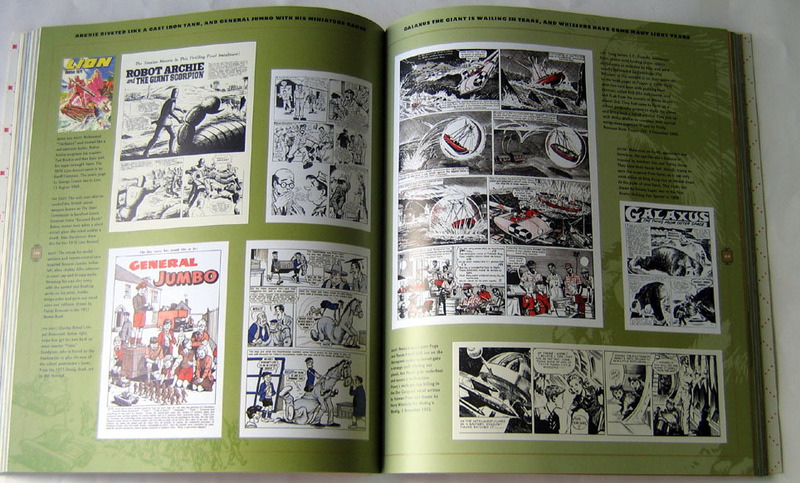 The book features a choice of two covers; the main one by Jimmy Broxton and a variant by Michael Allred. Imagine two of the UK's top humour talents teaming up to bring you top class entertainment. No, not Lennie Bennett and Jerry Stevens. I'm talking about two of the top talents in comics - Jamie Smart and Steve Bright! Yes, Jamie and Steve are teaming up, but unlike Spider-Man and whatever other superhero he chanced upon in Marvel Team-Up every month, these two won't be fighting on the rooftops of New York before combining their forces. 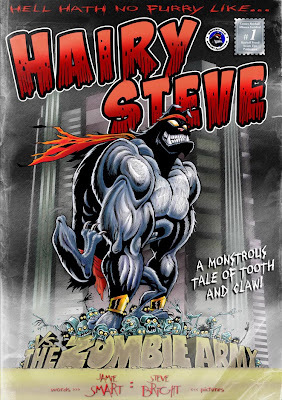 Smart and Bright are teaming up to work on a brand new British comic, - Hairy Steve, with Jamie on script and Steve on artwork. 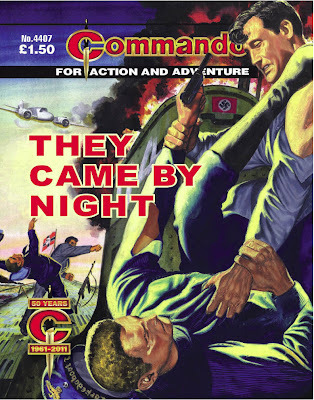 "Some people reading this may remember Hairy Steve, a tooth-and-fur comic about blood, swearing and nazis that I was writing about five years ago with the superb artist Steve Bright illustrating. I wrote about it on my journal and we showed a lot of the development art. Well it kinda fell by the wayside, both me and Steve had to get on with rent-paying work and leave Hairy Steve as a whim, a nice idea we’d one day like to return to." "This year, the idea of internet funding occurred. Comic artists asking for contributions to help them finish their comic, in return offering incentives to everyone who contributes, seems to me like a really organic way of producing art (and, more than that, free art). Being someone who puts most of his work online for free (and by god there’s a lot of it on here now), I find this idea intriguing and want to see if it works." "So far it has, in the first half an hour we had a flurry of very generous contributions. All the money earned will go towards printing a limited-run of this comic (only available to contributors), the rest going to pay Steve a wage. I take no profits. In return for contributing, you can get everything from signed comics to original sketches, even a zombie drawing of yourself." "And even if you can’t contribute, we would appreciate any help in promoting this. Share it around, spread the word! 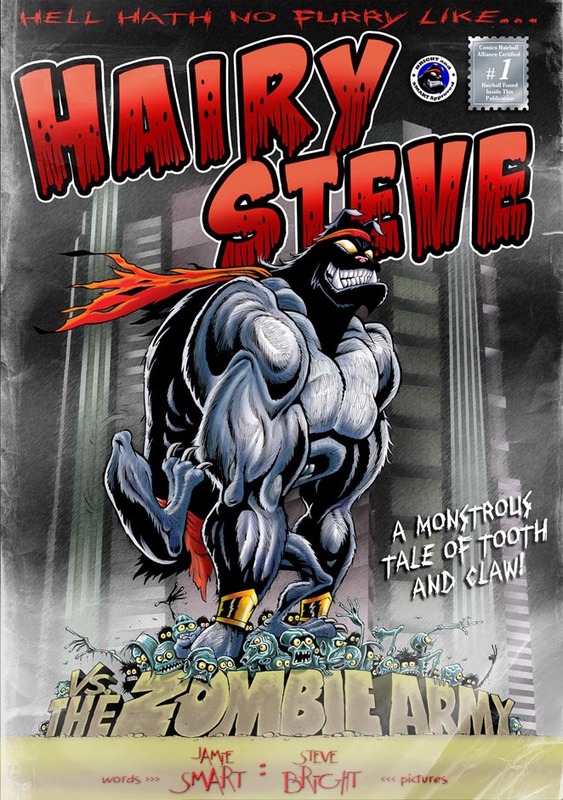 Because when we hit a quarter of our total, Hairy Steve will come online as a webcomic. So you get to read it anyway! EVERYONE WINS!" 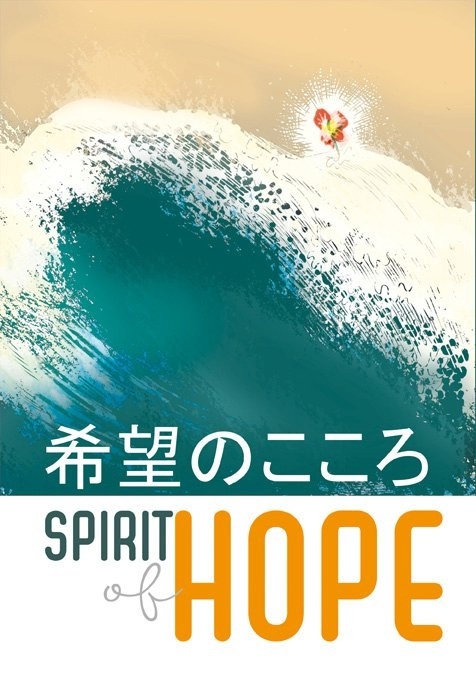 This coming Saturday (July 23rd) sees the official launch and signing of the Spirit of Hope book, a full colour softback anthology to raise money for the victims of the Japanese Tsunami and New Zealand earthquake. The event will take place at Forbidden Planet, 179 Shaftesbury Avenue, London, at 1.00pm to 4.00pm. Over 100 contributors have produced comic pages or illustrations for free and all profit from the title will go to help disaster victims via Second Harvest and the New Zealand Red Cross. Contributors who have said they'll attend the launch include Kev Hopgood, David Leach, Jon Haward, Jasper Bark, Steve Tanner, Peter Hogan, Si Spencer, myself, and more. As mentioned on this blog a while back, this year the annuals are being published earlier than their usual late August / early September schedule. 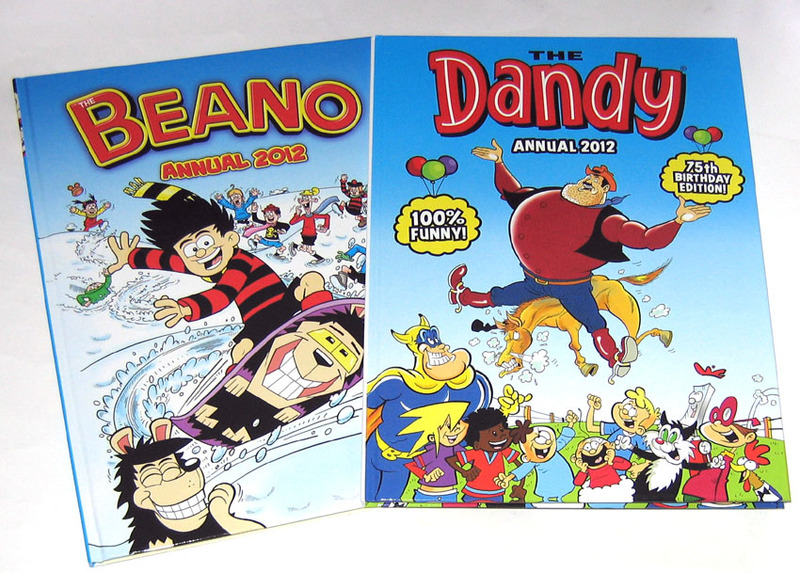 In fact The Dandy Annual 2012 and The Beano Annual 2012 are out now from DC Thomson. Each book has a R.R.P. of £7.99 but you'll easily find them cheaper. (Amazon currently has them at £5.49.) I know some collectors like to wait until they find unsold copies in bargain bookshops after Christmas for a pound, but that doesn't really help the industry and if we all did that the annuals would cease to be. The Dandy Annual uses a logo from 30 years ago to reflect its content of old and new characters. Fans will be pleased to hear that Bully Beef and Chips are back, now drawn by Laura Howell, and other favourites such as Corporal Clott, Brassneck, Beryl the Peril and Winker Watson also return. Traditionalists may not be so fond of the new styles given to some of the classic characters. 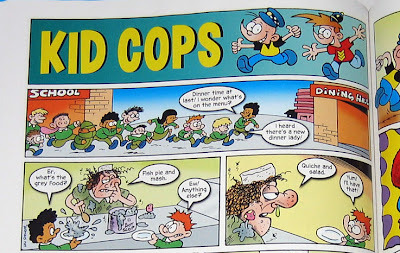 I'm sure Nigel Auchterlounie's version of Puss and Boots will ruffle a few feathers with the over-thirties, but the strips are still funny, - what else does a kid's comic annual need to be? 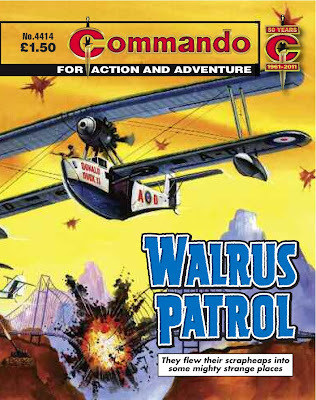 Young fans of the current Dandy weekly may be a little disappointed to find so few of their new favourites in the annual. 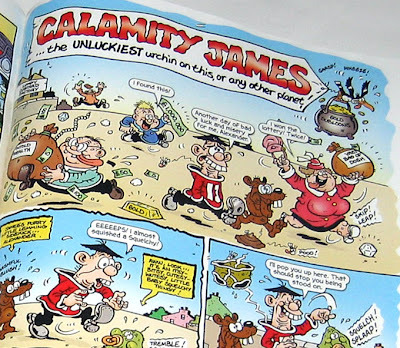 No Pre-Skool Prime Minister, no Postman Prat, no Harry Hill, and Nigel Parkinson draws a more traditional Desperate Dan than the revamped Jamie Smart version. 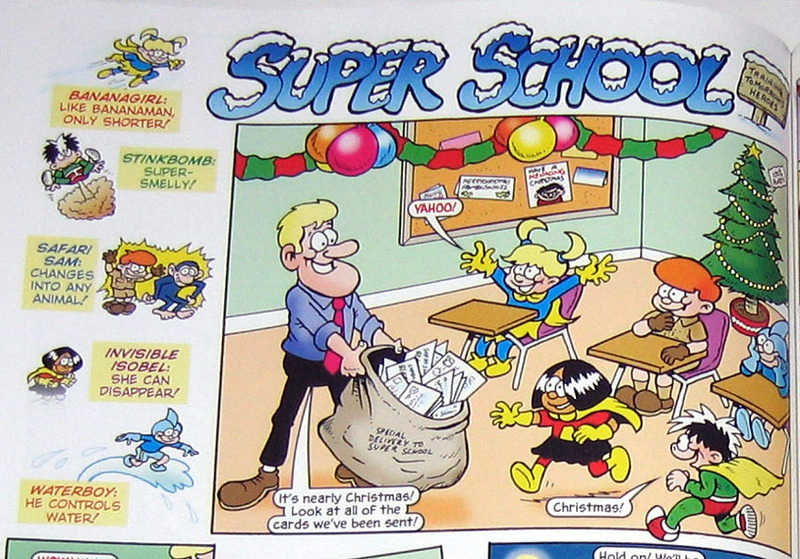 However, Andy Fanton's George and Dragon are here, along with Korky, Bananaman, and Kid Cops. Then again, the kids will probably enjoy it all the same, just as I did as a child when annuals featured strips that were new to me. 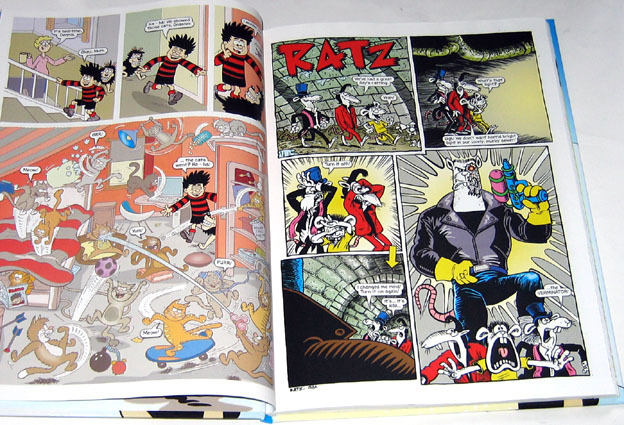 The Beano Annual includes all the usual long-term favourites Dennis and Gnasher, Roger the Dodger, The Bash Street Kids and Minnie the Minx. More recent hits such as Ratz are also on board, with some nice work by Hunt Emerson. 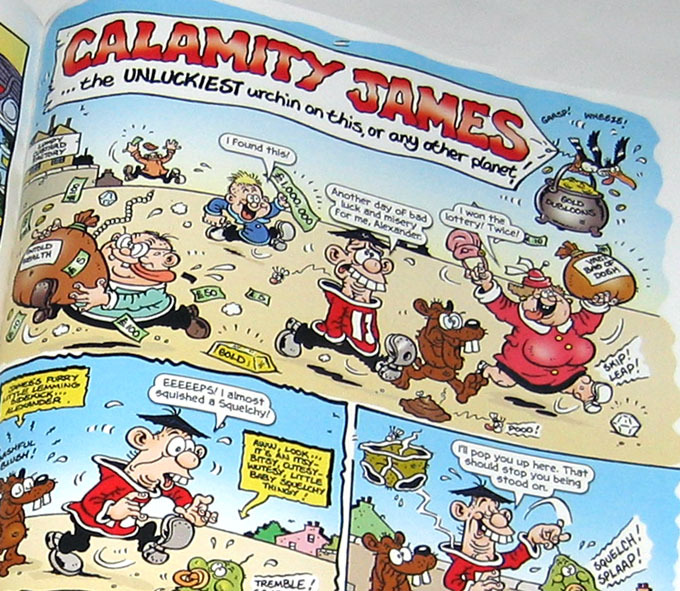 Fans of Calamity James will be pleased to hear that he's back, drawn by the brilliant Tom Paterson. Several of the strips feature a winter theme, which feels a bit odd with the books coming out in mid-Summer, but they'll be on sale for a good while yet. 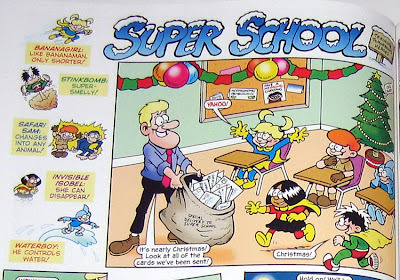 One of the winter stories is my own Super School strip, - three pages set on Christmas Eve! I designed a traditional Christmas logo with snow on it. Hope it doesn't melt. Crikey! What a nice surprise. The magazine of British comics, which sadly folded last August after 16 issues is to return next month, twelve months after its demise, as an all-new online edition. 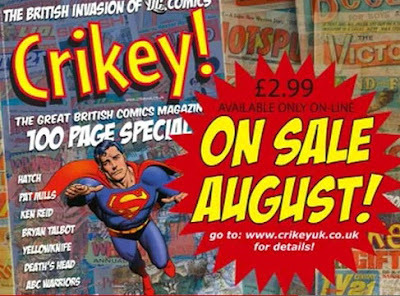 Keep your eye on http://www.crikeyuk.co.uk for more details! 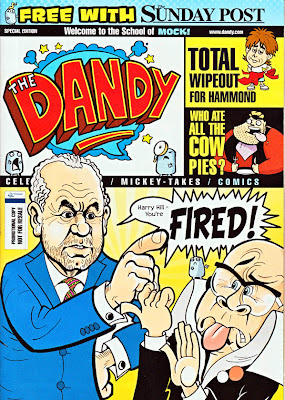 Comic fans should look out for the latest edition of The Sunday Post which includes a special issue of The Dandy. The free supplement features stories from the current version of the comic and is an ideal way to reach potential new readers as well as remind parents that the world's longest running comic is still being published. UPDATE: I was led to believe this freebie would only be available in Scottish editions of the paper but I'm pleased to say the free Dandy was also in copies here in the Midlands. Presumably then, it's all over the UK! 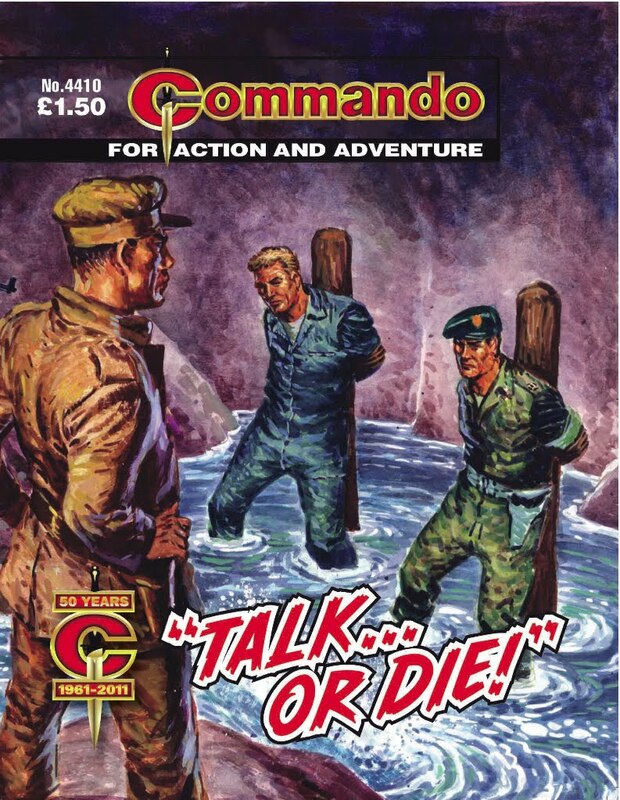 With the comic being available to every reader of The Sunday Post that's around 300,000 readers! Just a quick heads up for those of you interested in the genesis of British story papers. 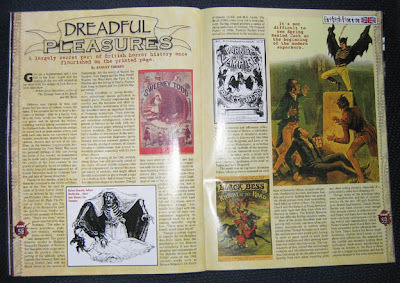 The latest issue of American horror magazine Fangoria spotlights British horror, and amongst such items on Amicus films and an interview with Ian Ogilvy there's also a feature on the 19th Century "Penny Dreadfuls". It's a short article, running to just over three pages, but it covers the basics and is well illustrated. The author Ashley Thorpe recounts how, 200 years ago, cheap fiction was mainly aimed at the middle classes (6d a book being far too much for working class people). Enter the birth of the weekly serial publication at just a penny a copy, with lurid tales of crime and horror from Varney the Vampire (predating Dracula by half a century) to Sweeny Todd, Demon Barber. The public lapped it up and, inevitably, Parliament blamed the "Penny Dreadfuls" for "the lamentable amount of juvenile criminality", therefore sowing the seeds of suspicion about horror entertainment that still lingers today. Fangoria No.305 is $8.99 and should be available from comic specialist shops. 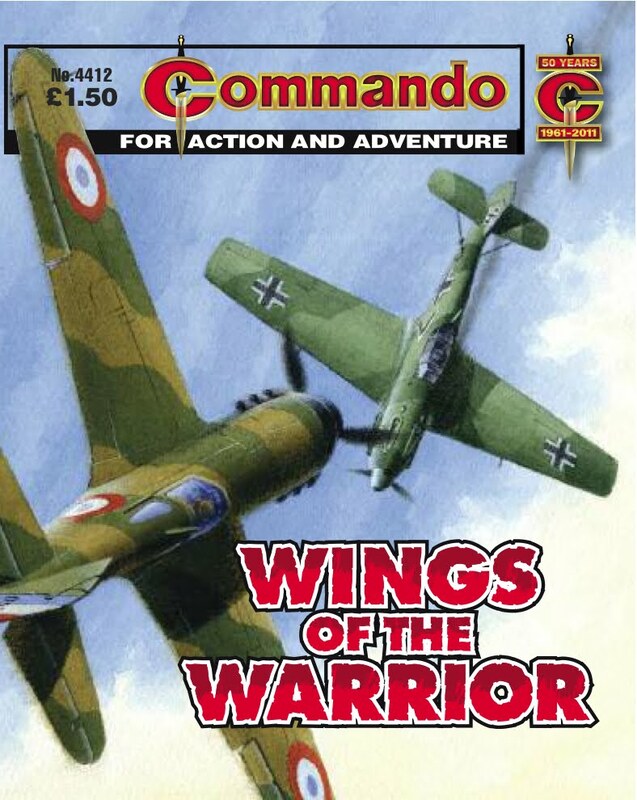 Some independent UK newsagents also stock it at £4.99. Here's a sneak peek at the four issues of Commando that go on sale from next Thursday, July 21st. 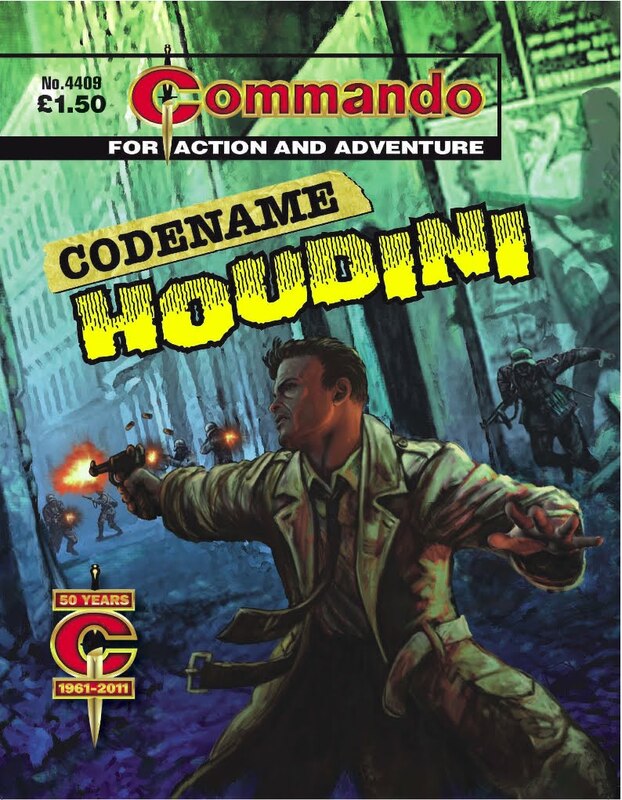 Thanks to Commando editor Calum Laird at DC Thomson for the press release. 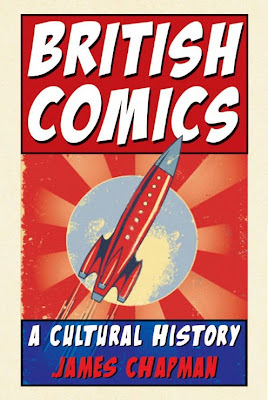 This October sees the publication of a new book on the history of UK comics. Titled British Comics: A Cultural History the 320 page hardback is written by James Chapman, a Professor of Film Studies who has previously authored books on film in relation to society. 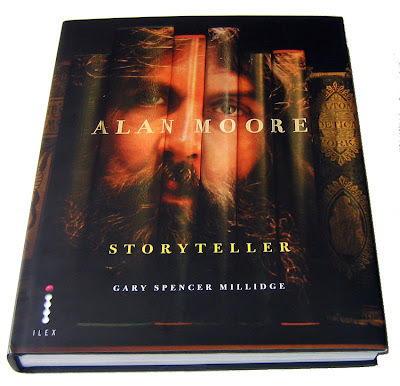 The book is now up for pre-order at Amazon UK. Back when the late comics historian Denis Gifford was still with us he seemed to be producing books on the history of comics on a regular basis, from the slim digest Discovering Comics to the weighty International Book of Comics. 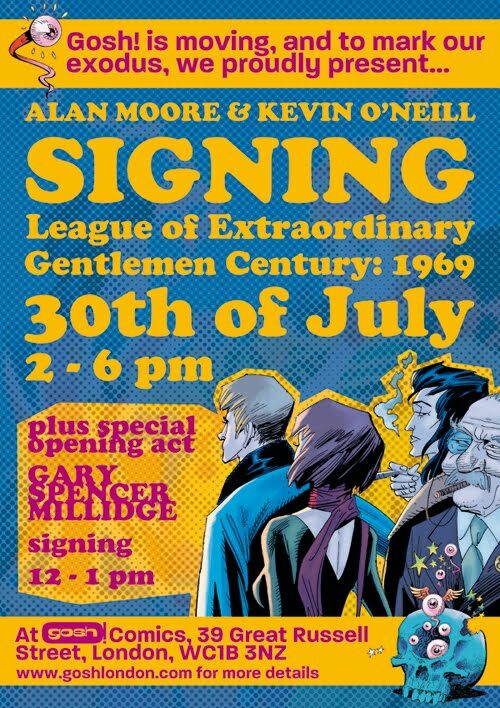 Back when I was 16 and supposedly revising for my 'O' Level exams at the local library I'd be pouring through Denis' Happy Days, One Hundred Years of Comics instead. It never did me any harm. In fact it inspired me and stood me in good stead for the future. 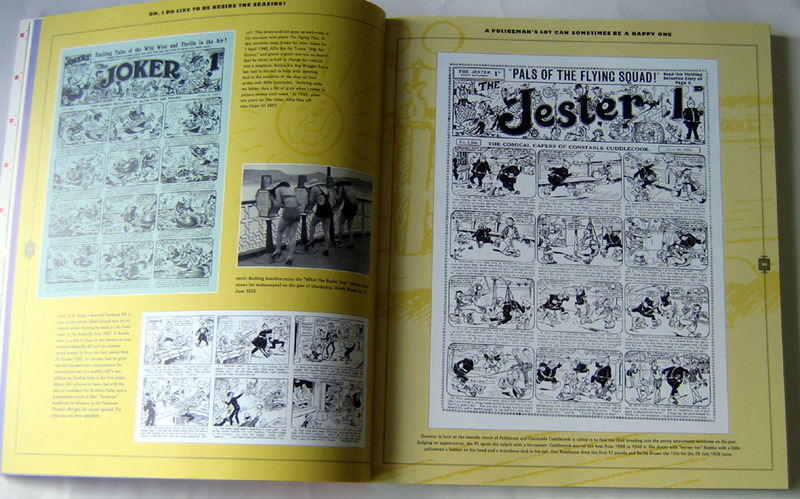 Since Denis died several years ago there's been much written on specific areas of British comics but not so much about the whole history of the artform. 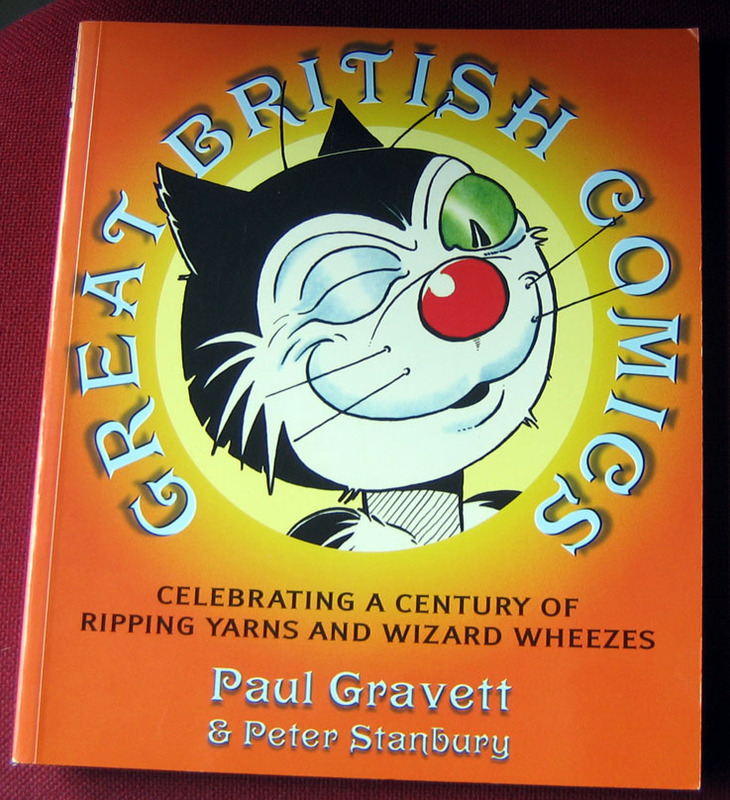 However one such book is Great British Comics by Paul Gravett and Peter Stanbury. 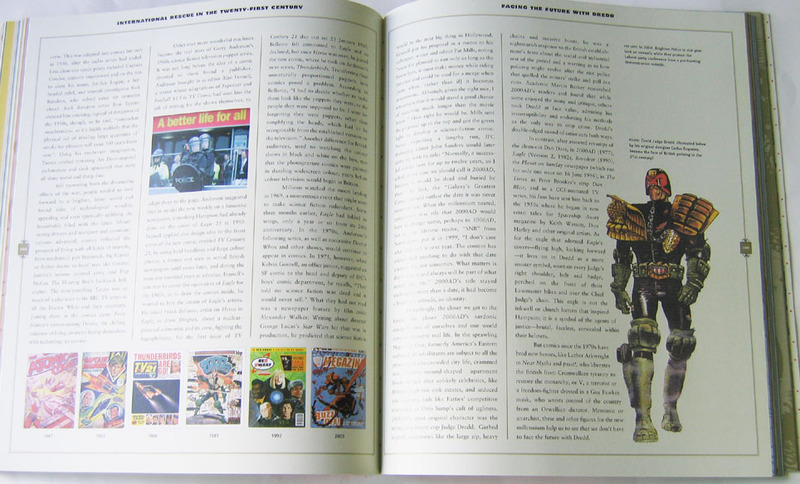 The large format 192 page softback was published in 2006 but copies are still available (here) and should be essential reading for anyone interested in the background of UK comics. 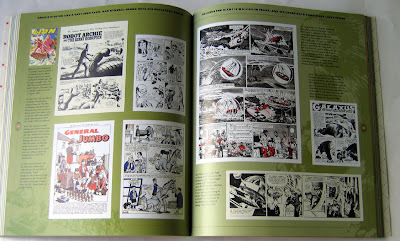 Here's a few snapshots of some of the spreads from Great British Comics to give you an idea. 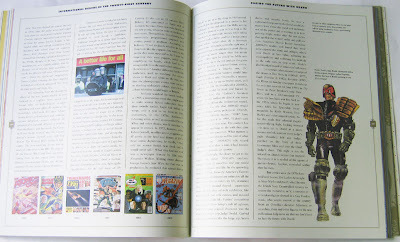 Every page is in full colour, the research is top-notch, and the book is well illustrated with crisp, clear scans throughout. Will James Chapman's British Comics book be a match for Great British Comics? No doubt it'll have its own opinions and approach to the history, but that can only be a good thing to broaden one's knowledge of the medium. Roll on October! Dave Marley was a policeman and proud of it. 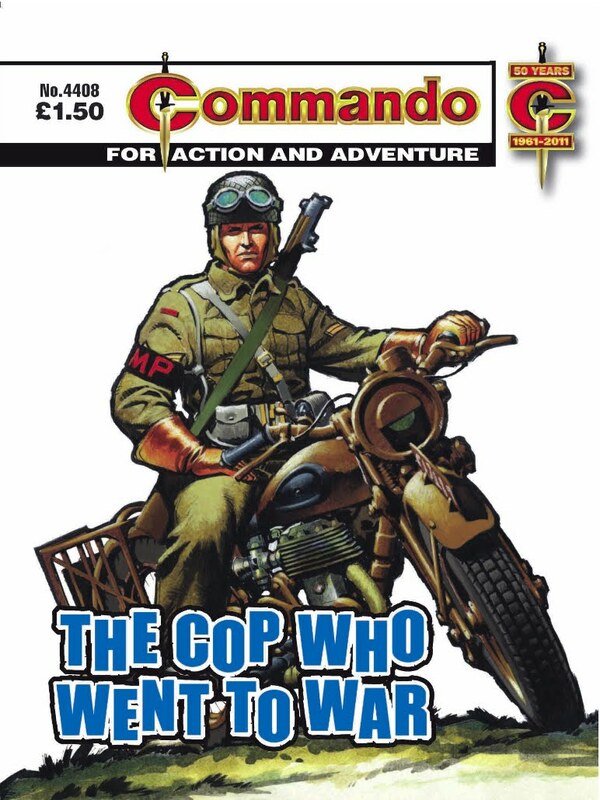 When the war came, he joined the Military Police and found that a lot of soldiers acted just like the blokes in civvy street who didn’t want to know a copper until they had trouble. I've recently joined DeviantART, the online arts community. I'm not sure why I didn't join years ago really, as I've been amazed at the quality and variety of art displayed there. It's good to see a few of my comic mates there too and to see what they've been up to. It's like an online convention! 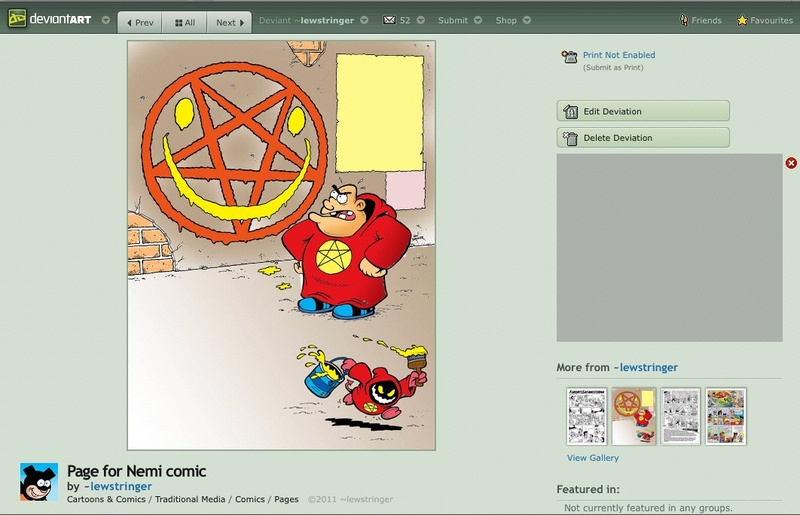 My page is still in development as DeviantART is still new to me so I'm finding my way around there when I have time. I've uploaded a few pages you may not have seen before, so visit my gallery and click on the images. (Then click on them again to view them larger.) I'll be posting more material there soon.